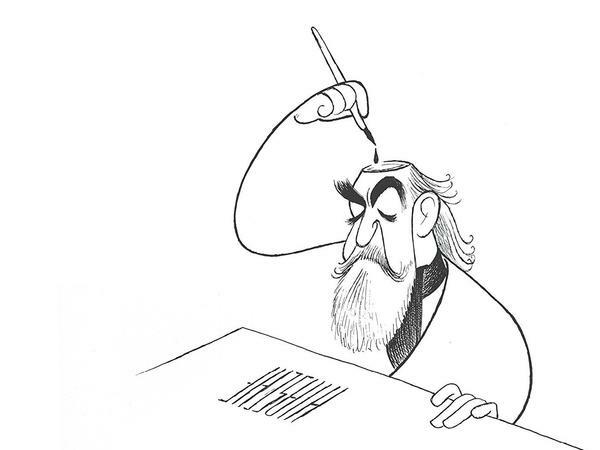 Ellen Stern's biography of theatrical caricaturist Al Hirschfeld reads more like a gossipy 300-page article in New York magazine (where Stern has worked) than the biography of record suggested by the definite article modifying its subtitle. And in fact, Hirschfeld: The Biography grew out of Stern's juicy interview for a 1987 GQ magazine profile of the artist. For those not put off by Stern's glib tone, there's plenty of what she calls "rich pickin's" in this portrait of Hirschfeld. A descendent of Russian-born Orthodox Jewish tailors, Albert Hirschfeld was born in St. Louis in 1903 and moved with his family to New York City before he was ten. He gravitated to drawing early. By his teens, he was already making good money illustrating ads, posters, and brochures for several film studios. He continued to work seven days a week, mostly freelance, through eight decades and three marriages, while also attending theater or hosting dinner parties several nights a week. But although Hirschfeld may have spent much of his life in a barber's chair drawing at an old oak drafting table in the top floor studio of his bubblegum pink Manhattan townhouse, he traveled widely for months at a time in his early adulthood — studying painting in Paris and lithography in London, refining his line in Fez, exploring his fascination with "ferment-through-theater" in Moscow, and capturing the hues of Tehran and Bali in watercolors he later hawked in New York. Stern makes it clear that he was no provincial. She also provides a lively account of the development of Hirschfeld's distinctive style, as well as welcome fact-checks on several of the tales he stretched as tall as his familiar elongated signature. But Stern's book is marred by several of her own stylistic choices, including her decision to chase a sense of immediacy by relaying Hirschfeld's life story — all 99 years of it — in the present tense. This gets old faster than her subject. Be forewarned, too, that Stern's narrative is splattered with enough barely contextualized names to fill a phone book — many of which are unlikely to ring bells. But as New York Times theatre critic Ben Brantley commented about the star–studded crowd he met chez Hirschfeld (after being introduced by Gloria Vanderbilt), "This was just his life." Among the artist's neighbors, for example, were songwriter Betty Comden, Chevy Chase, Mark Rothko, and Marlene Dietrich's daughter. Harder to ignore is Stern's predilection for cutesy puns, with the result that this biography feels like a vintage issue of Time magazine, filled with lines like "his Dôme away from home" to describe Hirschfeld's favorite Paris café and "with less Times on his hands" to describe his situation after The New York Times briefly cut him from its drama pages. Chapter headings include "Fiddling on the Roof" and "Game of the Name," which concerns the mania unleashed by the NINAs Hirschfeld began hiding in the wavy hair, ruffled collars, and fabric folds in his drawings after the birth of his only child in 1945. In her pursuit of informality, Stern goes overboard: Clothes are "duds," clean-shaven is "beaverless." About the strikingly stylized signature Hirschfeld developed in 1925, Stern comments, "He kinda likes the look." She reports what became of his first wife with glaring insouciance: "Flo bit the dust in 1985." Stern does an okay job capturing the impact of Hirschfeld's expressive, swooping black lines, for which Susan Dryfoos crowned him "The Line King" in her 1996 Oscar-nominated documentary — though David Leopold's 2015 lavishly illustrated coffee table book, The Hirschfeld Century, provides a better, more vivid picture of the flow and range of his work over the decades. "All actors come with a face, a coif, a costume," Stern writes. "But it's their fluster and grace that come from Hirschfeld." Still, she notes, while many clamored to be "Hirschfelded," not everyone appreciated the results. One person who did was his art dealer, Margo Feigen, who helped augment the artist's fortune by taking control of his inventory. (Stern's portrait of this woman is unflattering even by caricaturists' standards.) There's also dirt on Louise Kerz, the much-younger widow who swooped in after the death of Hirschfeld's second wife, German-English actress Dolly Haas. Many pages on the difficult life trajectory of his daughter Nina make for even sadder reading. But there are fun facts, too, in this evocation of a world in which newspapers and pen-and-ink flourished. One of my favorites: The hidden NINAs were used by both the Federal Aviation Agency and radiologists-in-training to test and heighten perceptual ability. Clearly, as his clever, memorable portraits still demonstrate, Hirschfeld's acuity and powers of observation were off the charts.